Q. What are varicose and spider veins ? Spider and varicose veins can appear anywhere, but most often appear on the legs and in the pelvic area. 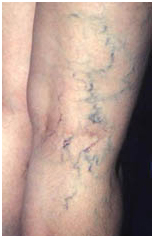 Most varicose veins develop near the surface of the skin. 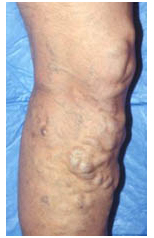 Deeper varicose veins may cause the skin above them to swell, become darker or hard. Q. What are the symptoms of varicose veins ? Some people do not have symptoms of varicose veins but may be concerned about the appearance of the veins. Varicose veins symptoms often worsen after prolonged standing or sitting. In women, symptoms may be worse during menstruation or pregnancy. Occasionally varicose veins can form a painful blood clot, referred to as superficial phlebitis (inflammation of a vein). Q. Who gets spider and varicose veins ? Varicose veins are common and are usually not a sign of a serious medical problem. Spider and varicose veins are seen more often in women than in men. Varicose Veins become more prevalent with age and have been reported to affect from 30-60% of the adult population. Q. What causes varicose and spider veins ? Q. When is treatment necessary for varicose veins ? Varicose and spider veins may not require medical treatment. If varicose veins make walking or standing painful, you should call your doctor for advice. You also should call your doctor if a sore develops on or near a varicose vein or if your feet or ankles swell. Q. How are varicose veins diagnosed ? Q. What are the treatment options for varicose and spider veins ? The goals of treatment are to reduce symptoms and prevent complications. Since not all varicose and spider veins require medical treatment, the goal of treatment may be simply to improve the appearance of the affected areas. The most conservative approach for treating varicose veins is to wear properly fitting support hose (also called compression stockings), especially when the veins are symptomatic. These stockings can generally be purchased at any surgical supply store and come in various styles including below-the-knee, above-the-knee and pantyhose styles. They also come in different compressions varying from 18 to 20 mmHg and up to 40 to 50 mmHg. Other conservative treatment approaches include practicing good skin hygiene, losing weight if you are overweight, exercising regularly (especially walking), avoiding prolonged periods of sitting or standing, and elevating your legs while sitting and sleeping. When you need to stand for long periods of time, take frequent breaks to sit down and elevate your feet. If conservative treatment does not achieve satisfactory relief of symptoms, or if the appearance of the veins is bothersome, other treatments may be offered, depending on your overall medical condition. Sclerotherapy : - Injection of a solution (generally sodium chloride) directly into the vein. The solution irritates the lining of the vessel, causing it to swell and stick together. Over time, the vessel turns into scar tissue that fades from view. The procedure is simple, relatively inexpensive, and can be performed in an outpatient setting. Read More..
Photoderm : - Intense, pulsed light can be used to selectively damage or destroy abnormal veins including small spider veins, certain sizes of varicose veins and vascular birthmarks. This treatment may be recommended when sclerotherapy or laser therapy does not effectively treat the vein. One to six treatments may be required to properly treat the area. Laser therapy : - Most effective for small facial and leg blood vessels, laser therapy heats the blood vessel and destroys it. Surgical ligation/stripping : - Severe or very large varicose veins may require surgical treatment in which the dilated vein is either removed or tied off through a small incision in the skin. The surgery is done in the hospital or outpatient setting by a vascular surgeon. VNUS catheter : - This is a new technique that uses a radio frequency device or laser carried by a catheter and seals off the varicose vein. Before choosing any treatment option, it is important to discuss the potential benefits, risks, and side effects with your health care provider. Q. Will my insurance cover the cost of treatment ? Many insurance companies do cover the cost of treating varicose veins, but generally not spider veins. The best approach is to check with your insurance company before considering a particular treatment option. Q. How can I prevent varicose and spider veins ? Q. Are varicose veins harmful? Venous stasis ulcers - ulcers (open sores) that result when the enlarged vein does not provide enough drainage of fluid from the skin. As a result, an ulcer may form. Complications are more common when varicose veins are the result of a problem or disease in the deep veins or in the perforating veins which connect the deep and superficial veins. These underlying conditions may include deep vein thrombosis or chronic venous insufficiency. Q. When should I call the doctor ?